"Education is much more than learning how to read and write; it has to do with understanding ourselves in relationship." "Perhaps the most important intention in educating young people is to provide and environment that is free from fear. Fear generates hate and violence, and therefore prevents understanding. 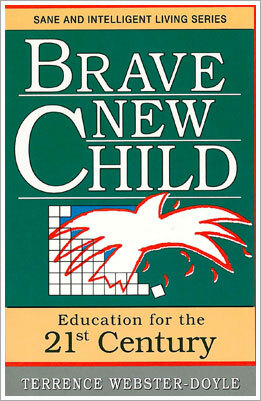 The nature and structure of fear must be explored within this new school if young people are to be free of conflict." "In this new school, children will be encouraged to understand what intelligence is; that is, that capacity that can understand conflict in relationship. Children will need to understand that sentiment and emotionalism can be destructive...the playing of national anthems and the political frenzy generated by melodramatic displays of patriotism are forces that destroy intelligence and only contribute to more conflict." "Can we help the child understand the whole of thinking: technological knowledge as well as knowledge that has entered the field of relationship...knowledge that has created social ills, knowledge that has created conflicting solutions to solve the problems knowledge has created?" This book is concerned with bringing about a psychological transformation in learning, awakening the capacity of intelligence that understands the destructive influences of psychological conditioning. This book explores a fundamentally different perspective in education that lays the foundation for a completely original way of learning and living.